"You are mistaken. I never doubted for a moment that you would put me to death." One of the great archetypal dramas of ancient Greece is the story of doomed Oedipus, the murder of his father and unknowing marriage to his own mother. But the story did not end with Oedipus' death, for he left several children. Sophocles' original drama is here updated by Jean Anouilh, presented in modern dress on modern sets. After Oedipus' death, his sons Polynices and Eteocles agreed to switch off occupying the throne of the city-state of Thebes each year. This arrangement lasted exactly one year before erupting in a civil war that resulted in both brothers being killed. Their uncle, Creon (Fritz Weaver) has assumed the throne and has buried Eteocles with honor. At the same time, Creon orders that Polynices be left to rot in the field. Anyone found burying Polynices is to be put to death. 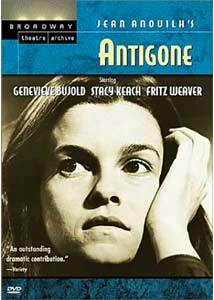 But their sister Antigone (Genevieve Bujold) has other ideas; even though she knows that it means her own death, she is determined that Polynices be given a burial so that his spirit is not forced to wander the earth forever. When Antigone is inevitably caught, she and Creon face off in a dramatic philosophical debate about duty, religion, truth and perception. This program was an episode of Theater in America, a PBS series devoted to the best of theater. The cast here is exceptional. The waifish Bujold is perfect, being both vulnerable and stubborn to a self-destructive fault in the memorable title role. Weaver is also forceful as the reluctant king who finds his niece defiant to a fault, and learns exactly what the nature of his kingship is. The supporting cast is fine as well. Stacy Keach in particular is notable as the Greek Chorus, smoking cigars and drinking brandy as he looks on bemused and makes sarcastic remarks. Aline Macmahon as the Nurse also turns in an excellent performance. James Naughton as Haemon, Antigone's betrothed, and Leah Chandler as her sister Ismene, are fairly colorless, but they really don't have much to do here. The presentation, as befits the type of program that it is, feels very stagebound much of the time. There are, however, occasional cinematic flourishes as the camera follows Antigone as she travels to and from the gravesite. The camera also isn't afraid to move and pan, helping relieve the monotony of a filmed stage production. The core of the drama is not the series of events; those are disposed of in the opening and closing narrations. The centerpiece is the clash between Antigone and Creon, between duty to family and to state, and between responsibility and convenience. This is a thoughtful drama that comes across quite well, with suitably intense performances, despite the abhorrent source materials. Image Transfer Review: The videotape master is just about the worst looking material I've ever seen on DVD. Thick scan lines are visible, the picture is exceedingly fuzzy, and colors bleed well outside the boundaries of their shapes. Antigone's red dress has an enormous red halo around it from the smearing. Black levels are very weak, and detail is nearly nonexistent. In a word, the picture is miserable. Think 7th or 8th generation VHS. Audio Transfer Review: The sound is a little better than the picture, but it's still not good. Dialogue suffers from frequent distortion. There is persistent hiss and noise, and an audible buzz makes an irritating appearance throughout. The audio is quite nasty indeed. Extras Review: There are brief selected filmographies (including theater highlights) for Bujold, Keach and Weaver. The layer change is placed at a fade to black, but it seems almost ridiculous to place a layer change less than 2 minutes into the program. The balance of the disc is taken up with previews of other DVDs in the Broadway Theatre Archive series. These previews total about 54 minutes in length, and sometimes are quite substantial excerpts from the dramas. The plays are Working, Fifth of July, King Lear (starring James Earl Jones), Beyond the Horizon, Antigone, Alice in Wonderland, Ah, Wilderness!, Mourning Becomes Electra, The Royal Family, Hamlet (starring Kevin Kline), The Iceman Cometh (the classic version with Jason Robards), The Seagull and The Time of Your Life. Source material varies from fair to good; this disc seems to be the worst in source quality in the entire series. A classic philosophical tragedy, with a stellar cast, hobbled significantly by the frankly poor videotape technology of the time. Worth a look for the content, but be prepared to be horrified by the A/V quality.